Jim Leslie of J.B. Leslie Contractor Co. of South Berwick surveys the work at Nubble Light in York in this May Seacoast Online file photo. YORK, Maine — York Days, the town’s annual gift to summer visitors and residents alike, started this week and continues through Aug. 5 with the annual York Days fireworks on Aug. 5. Missing from the lineup this year will be the annual Christmas in July, though, because of renovation work on the Cape Neddick Light Station and outbuildings on the Nubble. York Parks and Recreation Director Robin Cogger said months ago when plans were being made for this year’s York Days, the staff chose to make the “really difficult decision” not to hold the annual Christmas in July event, which typically involves a concert and a visit from Santa. 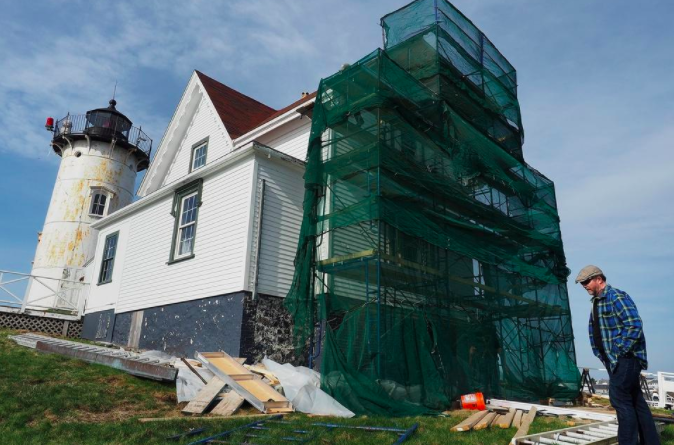 Work is proceeding nicely on the exterior renovations at the lighthouse, the keeper’s house and outbuildings, but “work can only happen weather and ocean permitting. Because of that, it seemed like a good idea not to have it this year. I think most people have been really understanding, though,” said Cogger. A restoration company was hired earlier this year to undertake a thorough exterior renovation of the buildings. With a positive vote in May, workers will continue with a second phase of the work, which includes restoration of the light tower balcony and railing, as well as repainting the tower with a special marine grade paint. “Really, we’ll roll it right over from phase 1 to phase 2,” she said. Other “tried and true” events include the co-ed softball tournament Saturday at York High and Village Elementary fields; the York Days 5K Road Race, with activities beginning at 8 a.m. this Sunday at York High School; another family movie night on Aug. 1 outside at York Town Hall; the annual York Days craft fair at the York Beach Ball Field on Aug. 4 and 5; and finally the fireworks starting at 9 p.m. on Aug. 5. Cogger said York Days is always a crowd pleaser, particularly with summer visitors. For more information, visit www.yorkparksandrec.org, visit its Facebook page, Town of York Maine Parks and Recreation Department, or visit the town’s Nubble Facebook page, Nubble Lighthouse.